Pianist Armen Donelian made the acquaintance of alto saxophonist Thomas Chapin in 1988. Ten years later, at the age of 40, Chapin died of leukemia. Rewind to two spring nights in 1992. At the New York jazz club Visiones, Chapin shares the stage with Donelian, bassist Calvin Hill, and drummer Jeff Williams. Five tracks of intricately composed, expansively improvised music were recorded that evening. The album, Quartet Language, illustrated with one of bassist Mario Pavone’s notoriously abstract photos, sounds of palpable emotions, dramatic landscapes, and garrulous characters. An acrid alchemy festers among these players, especially Donelian and Chapin. Memorable moments, like the catchy 11-note theme of Jabberwackey and the swaying intro of Loose As A Goose, are repeated, reversed, and explored until the players get caught up in a carousel of notes, tones, times, and timbre, all held together by Williams’ intrepid drumming. The Germ is a 12-minute exercise in extremes. Chapin’s lavish gallivants on his horn are countered by Donelian’s foray into minimalist syncopation. Then for the solos. Chapin prods and teases but his wry tale soon turns joyful. Donelian plays sassy vamps with the right hand, and dry staccato chords with the left. The last track, Brood Mood, sashays somberly with Chapin’s saxophone, awash with the sizzle of cymbals. Piano and bass lead themselves into lonely terrain, then regroup timidly, awkwardly, improvising nostalgically on each other’s lines. The moment of glory arrives with Mexico, a seductive bolero brimming with dark-eyed passion. Chapin’s long notes tremble, tortured by what can only be forbidden love. Donelian’s keys weep with wistful longing against Hill’s bass solo, like waves receding against the Acapulco coast, shimmering and consistent, but never exactly the same. Dedicated to Chapin’s memory, Quartet Language preserves a moment in four lives. At once bravely adventurous and breathlessly delicate, it’s a relic to be contemplated, and somehow, the enigma of life seems a little bit clearer. The fiery intensity of the late alto saxophonists Thomas Chapin is front and center on pianist Armen Donelian’s Quartet Language. Donelian's originals give the band a lot to work with, and Chapin makes the most of it, demonstrating why he is so sorely missed from the scene. Stalwart bassist Calvin Hill and the snappy drummer Jeff William provide deeply supportive rhythm playing. Donelian is a solid player, with a strong left hand and a ceaseless imagination. The music and the live recording are very fine, and I’m just as perplexed as Donelian at the difficulties he had in finding a label to release this date. Recommended. Pianist Armen Donelian is an inventive post- Bop player with a CV that includes a number of sessions as a leader as well as stints with Mongo Santamaria, Billy Harper, Chet Baker, and Rory Stuart amongst others. But the real news about this decade-old session is that it presents music recorded live with sax player Thomas Chapin. Captured over the course of two nights at Visiones in New York, the intimate recording finds the musicians in relaxed, expansive form, eager to stretch out on the five originals by the pianist. Recorded around the time that Chapin was creating his definitive, fiery trio music, this quartet captures his alto playing in a more mainstream setting. The reed player’s cutting tone and angular leaps provide the perfect foil to Donelian’s darting clusters. The jagged, swaggering theme of the opening Jabberwackey is a perfect example. Donelian prods and pokes with insistently stabbing, broken chords as Chapin takes off into a solo that swings hard, pushing toward freedom. Bassist Hill and drummer Williams stoke the groove with relaxed phrasing that gives the musicians plenty of freedom without ever losing the underlying pulse. These four are in total synch throughout. A phrase can start with Chapin’s alto and finish up on Williams’ toms; an elliptical melodic kernel insistently looped by Donelian might get twisted in to Hill’s thrumming bass playing. It is this sense of hearing a group of four players working their way through these improvisations that keeps the session charged throughout. Though it is easy to focus on Chapin’s playing, Donelian’s consistently engaging themes and understated piano playing are a significant contribution. Kudos to the pianist’s perseverance in searching for someone to put this rewarding session out. Ten years on, and it still sounds fresh and vibrant. This long lost treasure was recorded live at (the now defunkt) Visiones in May of 1992 and has remained in the can ever since, as Armen searched for an appropriate label. The late Thomas Chapin was one of the greatest alto sax & flute players of all time and also close friend and kindred spirit of mine. Many of us who got an opportunity to hear him play live will forever mourn his loss (in 1998), hence it is a joyous thing to actually have two previously unreleased discs come out this year, the other a fabulous live duo with Borah Bergman. Armen Donelian is another of those great unsung jazz piano heroes who has lived here for a couple of decades, yet only has a few discs in print as a leader (3 on Sunnyside). Both rhythm team players are also veterans, Calvin Hill has worked with McCoy Tyner, Betty Carter & Max Roach; Jeff Williams has worked with Dave Liebman, Stan Getz & Joe Lovano and has resurfaced in NY over the past few years. Right from the opening tune, Jabberwackey, Thomas' wonderful bittersweet alto sax tone sings true loud and clear and sends shivers of recognition through me. Thomas' solo shows off his infinite charm, balancing between the many worlds of jazz, swinging intensely yet almost breaking free of the song structure as he sails higher. Both Armen's consistently challenging songs and inventive solos are excellent throughout, also pushing the equally creative rhythm team. Each of the five pieces here are over ten minutes long and filled with some crafty surprises, unexpected twists and turns. On The Germ, there is piano and bass duo which sounds as if it were taken from another more classical piece, but still fits perfectly within the overall scheme. Mexico has a most relaxed and lovely melody, a sort of siesta with a beautiful, rich and haunting solos from Armen, Thomas and Calvin as well as righteous rhythm team support, especially Jeff's mallet work. Brood Mood, which closes features another slow, moody theme with a dreamy vibe. For me, Thomas' passionate solo is about as great as it gets, like a spirit reaching forth and pulling at our hearts and minds, all we can say is "Amen". Completely stunning. A perfect gift for someone you really love. Quartet Language is as much about history as it is about living in the moment. The 1992 live recording had to sit around for a decade before Playscape picked it up for release this year. Pianist Armen Donelian is a veteran whose credentials have never been in doubt: he first appeared on record a quarter century ago and has recently led a string of solid discs, mostly for Sunnyside. But in the end I suspect the decision to get Quartet Language out for public consumption might have more to do with Thomas Chapin than Donelian himself. Chapin, a long-time associate of Playscape frequent fliers Michael Musillami and Mario Pavone, was quite active in New York in the ‘90s until his untimely passing in 1999 from leukemia. His often energetic playing, especially on alto saxophone, always marked him as a free-spirited individual. He’s at the top of his game here with a combination of ragged tone and soulful delivery, always forward-looking, beckoning without weakness or compromise. The five selections on this record, all Donelian compositions, are all about twelve minutes long, which means that everyone gets a chance to stretch out. They’re marked by memorable melodies and the occasional odd meter. Jabberwackey opens the record with a dramatic flourish in 7/4, funky as hell and not the least bit awkward. Donelian’s off-kilter comping, direct and staccato, finds its balance in the form of Chapin’s slurred phrases. Armen Donelian is a very even-handed leader and his support often does more to propel the music than his solos, which are engaging in their own right. The soft bolero entitled Mexico draws from deep roots on both sides of the Atlantic. It’s a nice break from the faster-paced pieces on the record. Loose as a Goose sounds uncannily like Don Pullen’s African Brazilian Connection: Chapin’s insistent vibrato, Donelian’s blues/gospel inflections, and the ever-bubbling support from the rhythm section. The real strengths of this record are Donelian’s diverse compositions and Chapin’s talent for extracting the most from every phrase. Without either part, the record just wouldn’t work. Mark Armen Donelian on your list of musicians to watch, and rejoice at another opportunity to hear Thomas Chapin do his thing. This high-powered and colorful live set was recorded at New York's Visiones in 1992 but not released for the first time until 11 years later. Pianist Armen Donelian contributed all five selections, and he is heard leading a high-quality post-bop trio that is joined by the explosive alto playing of Thomas Chapin. Chapin, who prematurely died six years later at age 40 from leukemia, consistently steals the show. He sounds a lot like Eric Dolphy on Jabberwackey and is full of fire on each selection, bubbling over with intensity while still often playing within the chord changes. The relatively conservative setting for Chapin makes this a fairly accessible outing and an excellent example of his playing in modern mainstream jazz. Donelian's songs are excellent, particularly Jabberwackey (which alternates between 7/4 and 4/4 time), the bolero Mexico, and the passionate jazz waltz Loose as a Goose, and the interplay by the trio is stimulating and subtle. All of the performances are at least ten minutes long, yet this set moves by quickly. It is well worth several listens. 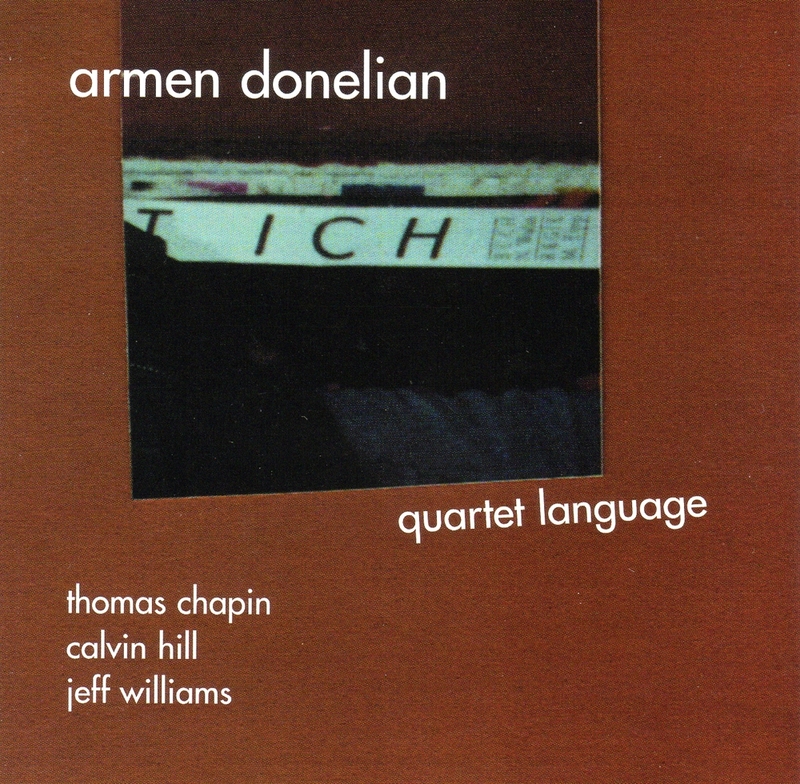 No offense to piano player Armen Donelian, but this live 1992 recording at New York's Visiones club, featuring the late alto saxophonist Thomas Chapin, might have been forgotten in Donelian's vaults, unless Donelian contacted guitarist Michael Musillami, who runs the Playscape label, and had Playscape not already released a disc by bassist Mario Pavone, who had played with Chapin. Donelian met Chapin in 1988 through Ara Dinkijian, leader of the band Night Ark (with whom Donelian had played) and once a classmate of Chapin's at the Hartt Conservatory. Donelian played in some of Chapin's early bands, but apparently none of them were recorded until this recording, a quartet with bass player Calvin Hill and drummer Jeff Williams. In true Chapin fashion, all the pieces on the recording are presented exactly as they were performed, with no overdubbing and no post-production. The five tracks, all composed by Donelian and all more than ten minutes long, leave Chapin enough space to stretch out, and for the most part Donelian seems to have chosen to support Chapin other than pursue solos, though Donelian's well-written compositions are the solid basis for Chapin's powerful tour-de-force, revealing again and again his creativity, musical imagination and great spirit. The first piece, Jabberwackey, alternates between an asymmetric 7/4 meter and the more conventional 4/4. Donelian's angular piano lines suggest a Monkish or even Middle-Eastern influence while Chapin takes it into a funkier realm. The second piece, The Germ, also uses changing meters and features inspiring duets between Chapin and Williams, followed by a boppish solo by Donelian. Mexico is a lyrical bolero that keeps the fire down, featuring a beautiful, gentle solo by Chapin following a beautiful opening by Donelian. Loose as a Goose gives every player an opportunity to rip-roar through the theme, Chapin demonstrating his excellent circular breathing. The final piece, Brood Mood, is a collective slow improvisation that climaxes with another memorable Chapin solo. It's quite a shame that we had to wait eleven years for this recording to be released, and then only because of Chapin's presence. With luck we will have more opportunities to hear Donelian alongside such strong characters as Chapin, and to hear more of Chapin's live concerts, especially with his regular trio with bass player Mario Pavone and Drummer Michael Sarin. There are four near-virtuoso players on Quartet Language, and while there is much to enjoy on this live CD from a 1992 date, I have mixed feelings about pianist-leader Armen Donelian. There's an elusive quality about his solos, which mount grand structures on small, even fragmentary phrases-an overstatement of understatement. For all his speed and busyness, his touch is diamond-hard, his articulation bright, and his expansive developments sometimes include layers of contrary rhythms, waves of sequences and ideas that tumbling the length of the keyboard (actually, these sound like hammy set pieces). Too often he hints at lyricism rather than actually becoming lyrical. But hear how a cell motive grows into a line and acquires energy in his long solo on The Germ-it's quite an achievement. Even though the songs Donelian composes have chord changes, they're elusive, too, especially Jabberwackey and The Germ, with their passages in odd meters. A sort of exception is Mexico, which sounds like a wistful Carla Bley song. By contrast, although alto saxophonist Thomas Chapin is frequently disorderly, he's full of melodic ideas. He has a hard, forceful sound reminiscent of Jackie McLean without the sharp-flat edges, and he has a special affinity for McLean-like phrasing. This eclectic player can evoke "hot" stylists, among them Eric Dolphy, Ornette Coleman and even Evan Parker's staccato horn-spits. He plays a lot of repetitive passages, yet in general his music is thrilling. Most exciting of all, he explodes into the otherwise dreary Brood Mood with wild, freewheeling lines outside the chord changes. Calvin Hill, who plays a highly ornamented solo in Mexico, is the bassist, and Jeff Williams is the colorful yet discreet drummer.